The Mazda Takeri concept takes SkyActiv a step further as the first Mazda equipped with regenerative braking. YOKOHAMA, Japan -- Mazda Motor Corp. has unveiled a sculpted, mid-sized sedan concept that strongly foreshadows the next generation Mazda6 and comes equipped with a regenerative braking system that helps save fuel by powering the car's electrical system. The Takeri concept, to be shown at the Tokyo Motor Show in late November, employs the brand's new kodo design language that debuts in the CX-5 small crossover. 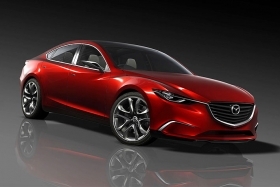 The car strongly hints at the upcoming redesign of the Mazda6, said Hidetoshi Kudo, general manager for product strategy. The concept brims with Mazda's new SkyActiv fuel-saving technologies, including the SkyActiv-D clean diesel engine, the new six-speed automatic transmission, a new body and chassis framework and an engine idle-stop system. But Takeri takes SkyActiv a step further as the first Mazda equipped with regenerative braking. The system converts kinetic energy to electricity during deceleration and stores it in capacitors for use later in powering air conditioning, audio systems, lighting and other equipment. The technology saves fuel because it relieves the engine of having to generate electricity -- enabling it to more efficiently apply power to moving the car. Mazda says capacitors are more efficient than using batteries because they can charge more quickly and have a longer lifespan. Mazda aims to score big with styling and mileage in the next-generation Mazda6, which is competing in an increasingly cut-throat segment. The sedan, expected to appear at the end of next year, will no longer be made at Mazda's plant in Flat Rock, Mich.
Mazda sold 24,914 Mazda6 sedans through the first nine months of 2011, down 8 percent from the same period in 2010. Mazda expects to offer gasoline and diesel versions of the revamped Mazda6 when it goes on sale in the United States, Kudo said. The model currently doesn't come in a diesel variant. The company has already announced plans to have gasoline and diesel options on the CX-5. By 2015, all Mazda vehicles will get Skyactiv technologies and will reflect the more aggressive and sporty design philosophy that Mazda calls kodo, Japanese for "soul of motion." In the Takeri, it manifests itself most clearly in the so-called Signature Wing grille, which plays off the brand's logo with wingtips bisecting the headlamps.